We like to say that the frame is the "stage upon which the artwork performs. Good design based on commonly accepted framing principles results in a well-balanced presentation that enhances the artwork without overpowering it and correctly aligns the work with the interior finishes. Therefore, our goal is help identify through a consultative process the best combination of frame style, quality and finishes which is in line with your budget and is the right match for your interior décor and in coordination with the artwork. This may take a few moments  and we may even want to take samples to your home or office to verify the style with your furniture before you finalize your order. That results in meticulous design. There are literally thousands of different available profiles made worldwide in all sizes, colors, finishes from innumerable species of wood, as well as metal mouldings. Not surprisingly, they vary in price considerably, and why from a distance some may look similar, upon close inspection, the adage “you get what you pay for” make sense. 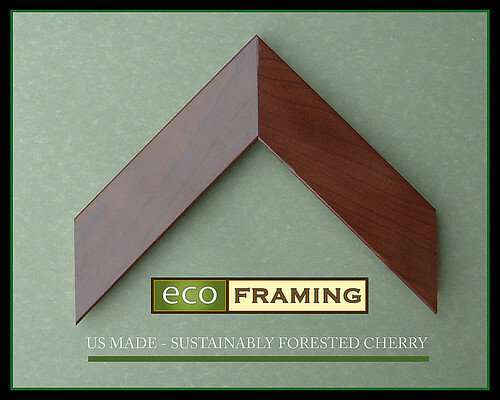 This does not mean that you have to pay a fortune to get a great looking frame, however mouldings are made in the US from sustainable sources of wood, with high levels of craftsmanship tend to be more expensive. The same may also be true of fine Italian mouldings that often involve considerable labor; complex finishes, and higher costs of labor. On the other hand, lower cost products tend to be made in Asia where labor is considerable less and sustainability and forest friendly approaches may not be standard procedure. There are a variety of ways that the selection of your frame can be more carbon friendly. The obvious one in special orders is to select from trusted manufactures that can certify that their products are made according to the standards of FSC, PEFC or SFI. This includes as mentioned in the section “Framing Green” the forestry process, how the plant is run, how it manages air and water pollution from the finish process and waste management. We consider other factors such the supply chain getting the materials to our shop for final assembly, packaging materials, quality of product which improves utilization and the venders general approach, knowledge, disclosures and integrity related to our review of their practices. We are in a continual process of reviewing, revising and refining our knowledge bases with our vender partners to support this and provide the best possible recommendations  line by line, company by company. Further, just because a product is not made in America , does not mean that it is not eco friendly  for example, finger jointed pine, often from New Zealand is responsibly grown and can be painted in many ways or wrapped with specialty foil hot stamps to make it resemble exotic hardwoods. While we are happy to order in for you anything that is available, and while some pieces will call for special designs that require these extra efforts, we also have another idea to consider. If you are only doing a few pieces, we are less able to purchase your special order efficiently - as we are buying a few sticks or sheets of mat board at a time. By that we mean that our vender will have to repackage the special order, create additional waste, their price to us is higher, our ratio of cut-offs increase, there is more paperwork, and a series of trucks and trains are often required to get that special order to our shop. Understandably, that will also significantly affect the price. Of course if your order involves 20 frames and we can order a case quantity, then efficiencies improve, prices go down and the project is more carbon friendly. In view of this workflow, which by design makes special orders cumbersome, wasteful and costly, we developed an alternative strategy to provide you with high quality design AND reduced cost. Unlike conventional shops operating from expensive retail storefronts, we work from our warehouse production facility, which has the space to have landed inventory in significantly greater capacity. Currently we have over 20,000 feet of moulding in hundreds of styles and 8,000 mat boards in hundreds of colors. This means that in many cases, we will be able to produce your special order project, WITHOUT having to make a special order at all. Your moulding will be in 'bin 57' and the mat board is in 'section 234'. Voila’, your frame is made quicker, cheaper with less waste  everyone wins, including the world we are trying to save one step at time.